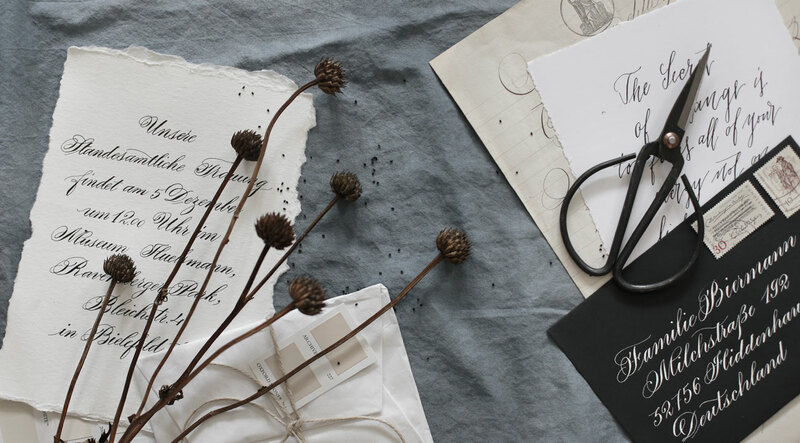 Nicnillas ink specializes in calligraphy and hand lettering. It`s all about the passion of putting dreams on paper and making visions be seen. idea and create something truly unique. and make it visible. After all, you want your guests to share your joyful anticipation. For more information on the process and experience, please fill out the “contact” form. Please get in touch with me with your idea and I will get back to you within 3 business days with an estimated quote. After the initial inquiry we’ll have an in-depth phone conversation, video-call or meet in person to discuss the project in detail. This is ideal to get to know each other and helps me figure out how I can help you put your dreams on paper. Per our conversation and timeline, I’ll get to work and start designing and will present you with a design that has been created with your briefing and wishes in mind. Please allow 4 to 8 weeks for a custom design. You receive the first draft and let me know any wishes for alterations. There are 2 rounds of revisions are included in my prices. If you wish to see more designs than that, I am happy to do so, but there will be an additional fee. Each piece is custom-designed to your needs and wishes and made uniquely for your special event. This is the reason, why quoting exact prices is not possible. Please accept that a detailed quote can only be made after we had an in depth chat about your needs and wishes concerning your project. Please use the contact section, and I’d be more than happy to provide you with a quote to put your dreams on paper!